On Friday, Michael Phelps tied with two other swimmers—Laszlo Cseh of Hungary and Chad le Clos of South Africa—for silver in the 100-meter butterfly. In one way it was historic, the first time three athletes had tied for a medal in Olympic swimming history. But at the same time, it felt unsurprising. Since the Rio games began, swimmers had already tied for podium spots in two other races. Swimmers have tied for medals 12 times in the Olympics, according to our survey of results published online by the International Olympic Committee. Six of the ties belong to men, and six to women. The first one occurred in 1984, when the Netherlands’ Annemarie Verstappen and the US’s Nancy Hogshead both completed the women’s 100-meter freestyle in 55.92 seconds. This summer, in addition to the three-way Phelps-Cseh-le Clos split, women tied for medals in the 100-meter backstroke and the 100-meter freestyle. 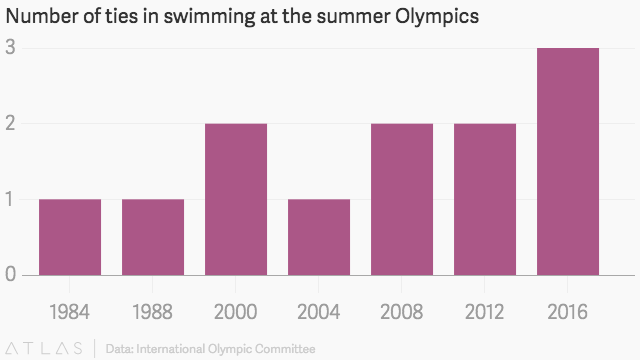 Why are ties relatively common in Olympic swimming? And why don’t we measure times more precisely to break them? The answer dates to 1972, when America’s Tim McKee narrowly lost the gold in the 400-meter individual medley. That summer, McKee and his competitor, Sweden’s Gunnar Larsson, each swam the race in a record-setting 4 minutes, 31.98 seconds. But rather than award first place to both athletes, officials decided to compare their times by one additional decimal place. McKee lost, by two-thousandths of a second. The decision proved controversial. A millisecond is hundreds of times faster than the blink of a human eye. To rely on it as a tie breaker in swimming, you need to ensure that no athlete is swimming in a lane that might be several thousandths of a second shorter—a difference that could come down to a single coat of paint. Fina, the international body that governs swimming and other water sports, tolerates differences of up to 3 centimeters between pool lanes in the Olympics. Even at the fastest swimming pace on record, that distance translates to more than two-thousandths of a second in added time. After McKee’s loss to Larsson, the rules of Olympic swimming changed to measure times only to the hundredth of a second. The ties started rolling in shortly thereafter.